It was the Saturday morning before the Sunday when the Kickstarter would be ending. There were about 30 hours left of our 30 day crowd-funding campaign and we were still trailing our hopeful goal of $75K by about $40K. 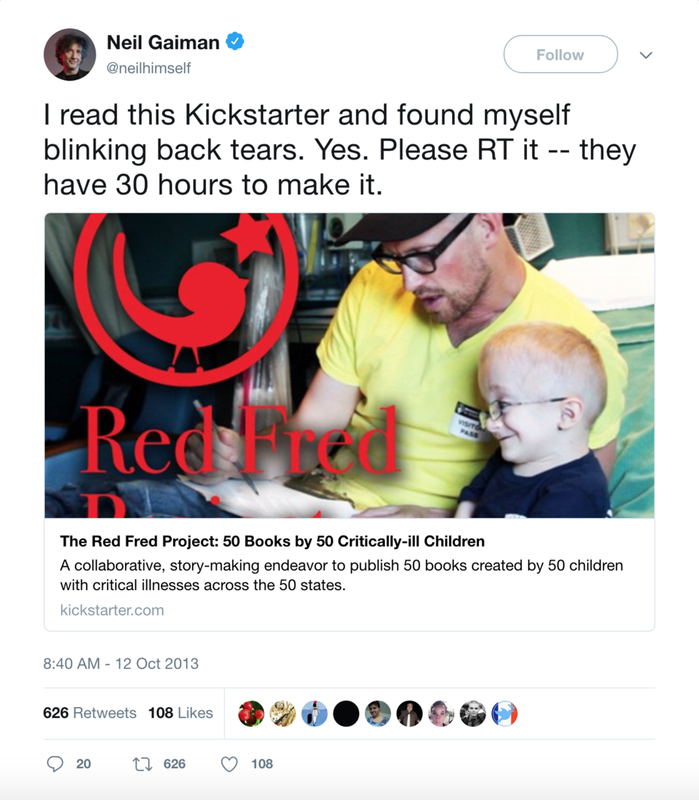 You see, I thought there was enough interest in this Red Fred Project concept that I thought raising $75K in 30 days was possible. Note: I had never done ANY manner of fundraising until this point in my life and I happily admit I was BOTH naive and gregarious. It's also important to for another note: Kickstarter campaigns only get funded if the projected monetary goal is met by the time the campaign ends. If you're a dollar shy of your goal, no funds leave any of your would-be backers' bank accounts. It's all or nothing experience. Which is why—after 29 days—my nerves were shot, my emotions raw, and I somehow thought that in 30 hours I could convince everyone I know to help me raise $40K. I had hunkered down on my boyfriend's sofa in my sweatpants and with my laptop ready to spend the entire day making social media posts, writing emails, updating my status if as much as $50 was pledged when I got the message from my friend, Patrick. > Patrick: Dallas. Neil Gaiman just tweeted your Kickstarter! > Dallas: What do you mean?! I sat there. Stunned. Silent. Shaking my head. How is this possible? You see, Neil Gaiman isn't just anybody. He's Neil Gaiman—the British novelist in a literary playground of his own making and his fans, who are legion, are ardent lovers of his works. He writes something existing between fantasy, sci-fi and reality with a special twist to almost every character. He's Neil Gaiman. And he had just tweeted our Kickstarter. I hit the "refresh" prompt on my laptop. The total pledge that I had been viewing jumped by about $500. I hit the "refresh" prompt again. This time it jumped $1,500. I shook my head in disbelief and the tears started flowing. The messages began pouring in via Facebook and Instagram, text messages on my phone mixed with the mingling of people trying to call me. All of the messages bore the same message: Dallas: this is going to happen! It's hard to describe the feeling—today as much as the minutes and moments it was happening then—but it's that feeling of being a recipient of someone else's generosity and thoughtfulness, the results of which have the potential to change the trajectory of your life. I will never forget that feeling because each time I saw the pledges climb and climb there way toward $75, I kept thinking about that question: How did Neil Gaiman find our Kickstarter? Within 2 hours, $40K poured in from strangers all over the world and Red Fred Project leapt to life! But it didn't stop. We still had 28 more hours and the pledges kept climbing. I'm tearing up now, writing this, because the power of impact Neil had with his 140 characters created a landscape where I now get to create books with extraordinary kids. After we were funded, I sent him a DM and thanked him for single-handedly making RFP a reality. He was kind and candid in his reply (and usually, you don't imagine a celebrity of his reputation would reply directly, but he did). "I'm excited for you! Good luck with the project!" So, do you see why he's Red Fred Project's patron saint? "Where can I send my legions today? Who can I help?"